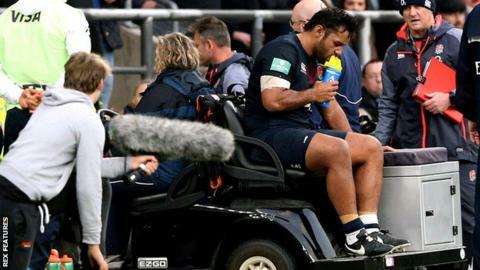 England's Billy Vunipola is likely to miss the Six Nations with a knee injury which will keep him out of action for at least three months. The Saracens number eight, 24, tore cartilage during England's 27-14 defeat of Argentina at Twickenham on Saturday. He had surgery on Sunday and is not expected to recover in time for the Six Nations, which begins on 4 February. England will play Australia at Twickenham on Saturday in the last of their autumn internationals. "Billy's been absolutely fantastic for England over the last 11 months and we wish him a quick recovery," said England head coach Eddie Jones. "He's a very influential player in the set-up and there's no doubt he'll be missed for the game against Australia. "We've had five or six frontline players missing throughout the series, so I've no doubt we'll adapt and work that little bit harder this week. I'm sure the players will respond to this by going up a level and peak for this game." Vunipola was also set to be a key figure when Premiership leaders Saracens resume their defence of the European Champions Cup next month. Back-row forward Jack Clifford has been added to the England squad for the game against Australia, although he will be assessed by the England medics after suffering a head injury while playing for Harlequins on Sunday. Sale's Josh Beaumont is also part of the 33-man squad, but Gloucester's Ben Morgan has not been included. Nathan Hughes is the leading candidate to start in place of Vunipola despite an ongoing foot problem. Elliot Daly will miss the match against the Wallabies after his red card against Argentina. Sale's Mike Haley has been added to the squad in his place. Dave Attwood (Bath Rugby), Josh Beaumont (Sale Sharks), Dan Cole (Leicester Tigers), Jack Clifford (Harlequins), Charlie Ewels (Bath Rugby), Ellis Genge (Leicester Tigers), Jamie George (Saracens), Teimana Harrison (Northampton Saints), Dylan Hartley (Northampton Saints), Nathan Hughes (Wasps), George Kruis (Saracens), Joe Launchbury (Wasps), Courtney Lawes (Northampton Saints), Joe Marler (Harlequins), Chris Robshaw (Harlequins), Kyle Sinckler (Harlequins), Tommy Taylor (Wasps), Mako Vunipola (Saracens), Tom Wood (Northampton Saints). Mike Brown (Harlequins), Danny Care (Harlequins), Owen Farrell (Saracens), George Ford (Bath Rugby), Alex Goode (Saracens), Mike Haley (Sale Sharks), Jonathan Joseph (Bath Rugby), Alex Lozowski (Saracens), Jonny May (Gloucester Rugby), Semesa Rokoduguni (Bath Rugby), Henry Slade (Exeter Chiefs), Ben Te'o (Worcester Warriors), Marland Yarde (Harlequins), Ben Youngs (Leicester Tigers).